It begins in the early 80s as an initiative by some professionals with training and expertise acquired in the Comar shipyard, manufacturer of the legendary Comets. In the same context, made of names destined to become famous, a small company named PM Marina acquired Quick in 1992, and this very association, solid and innovative, will guide the company towards important goals and the development of a wide array of products, from windlasses to thrusters, from battery chargers to nautical boilers, from remote controls to navigation lights, gyro stabilizers to the Marine Lighting Quick Division, started in 2007. 1983 The owners Michele Marzucco and Alfonso Peduto founds PM Marina Sales and assistance of nautical equipment. 1992 Quick, owned by M.Marzucco and A.Peduto, is started. 1996 Launches its fi rst windlass: Aries. 1998 Acquires the Italian branch of Atwood, Nautic Boiler. 1999 Moves to the premises in Piangipane, a 7.000 mq (75.350 sq.ft) of premises and 20.000 mq (215.280 sq.ft) of land. 2001 Acquires the historical Scotti company, navigation lights manufacturer. 2003 Buys C.a.t.t. Srl, a company with 25-years experience in machining and manufacturing of moulds for plastics. 2006 Opening of Quick USA LLC in Maryland. 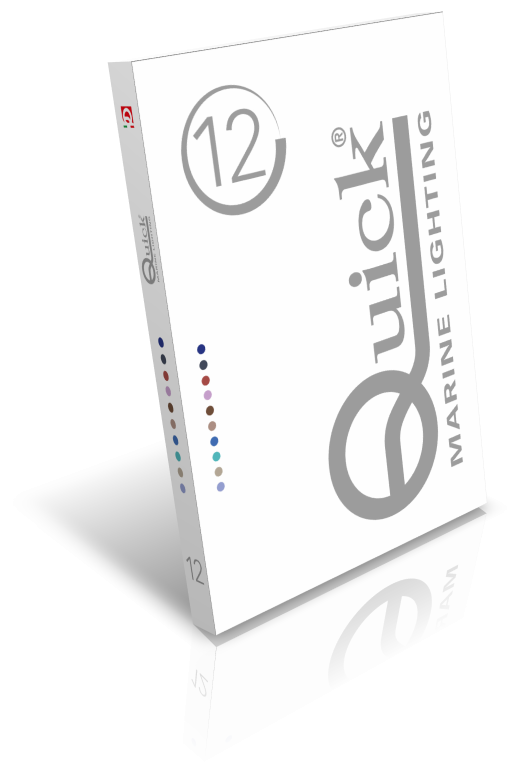 2007 The new division Quick Marine Lighting. Acquires the Sigmar Marine Srl. Enlarges its headquarter to 12.000 m2 (129.200 sq.ft) of premises and up to 56.000 m2 (602.778 sq.ft) of land. 2012 the LED lighting brand for house applications is started.